Oliver Queen thought he had it all figured out. As the heroic archer Green Arrow, he’d finally found a sense of purpose, friends to aid him, even a place on the Justice League of America. But now he’s not even sure where he came from… or whom he came from. Acclaimed creative team Jeff Lemire (Animal Man) and Andrea Sorrentino (I, Vampire) take Green Arrow on his most challenging adventure yet. 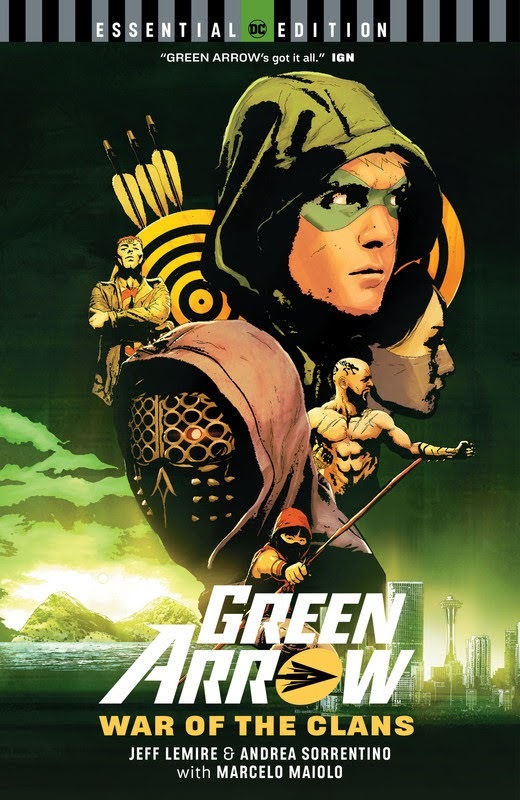 Collects Green Arrow #17-34, Green Arrow Futures End #1 and Green Arrow Secret Origins. The DC Essential Edition series of graphic novels highlights the best standalone stories the medium has to offer featuring comics‘ greatest characters. These trade paperback editions focus on the easiest entry points DC has in its vast library, with seminal, groundbreaking tales that transcend the printed page. Start with the Essentials.